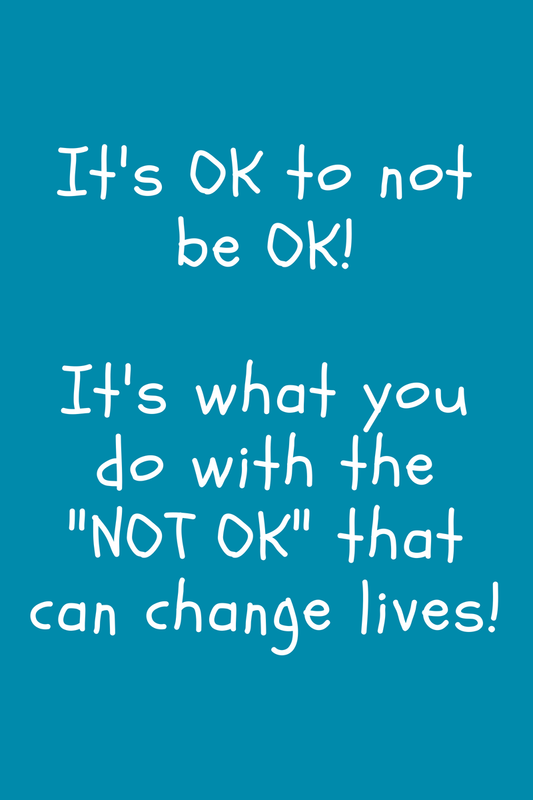 So today has been one of those days where I am not "OK."
And I have to remind myself that it is OK to not be OK! Honestly most days the brokenness and ick of this world really is not OK with me! Sometimes it is just too much to handle. Sometimes I am immobilized by the heartache. Sometimes I can't see past the pain. These are the days I just need to vent! These are the days I just need to not be OK with it all! These are the days I just need to cry! These are the days I just need to say no, I am not OK with the hurt and pain in this world! Does this mean I will quit or I will give up? This means I will kick, I will scream, I will cry, I will vent, I will turn to Him! It means that I will keep on loving the best that I can! It means that I will keep on begging Jesus to lead the way! It means that I will keep looking for the good in the world! It means that I will keep knocking down walls and seeking change in this world! It means that I will keep seeking Him and prayerfully showing others the Hope there is in Jesus! I LOVE what God has called me to do in this world! But some days the burdens of this world feel like a lead blanket weighing me down, some days it feels like everyone is looking to me for something, for some kind of answer...which typically means that I am carrying to much of the weight! Jesus is the only answer to the ick of this world! And I have to remember to point to Him every time no matter what. And sometimes I just have to remember that we are not supposed to be OK with it all! That God created us to be with Him in heaven and that one day we will be! But until then, it's OK to not be OK! Hello sister Michelle. I am a PASTOR from Mumbai, India. I am glad to stop by your profile on the blogger and the blog post. I am also blessed and feel privileged and honored to get connected with you as well as know you and about your being passionate about loving others. Wow what a positive approach to the negatives " It is ok to not be ok . I am so blessed by your blog post which is so encouraging , enriching and strengthening in our faith. I love getting connected with the people of God around the globe to be encouraged, strengthened and praying for one another. I have been in the Pastoral ministry for last 40 yrs in this great city of MUMBAI a city with a great contrast where richest of rich and the poorest of poor live. We reach out to the poorest of poor with the love of Christ to bring healing to the brokenhearted. We also encourage young and the adults from the west to come to Mumbai to work with us during their vacation time. We would love to have your grown up children to come to Mumbai to work with us during their vacation time. I am sure they will have a life changing experience. Looking forward to hear from you very soon. God's richest blessings on you, your family and ministry called " Grace Like Rain". I would love to know more about your ministry and would love to be a prat of your ministry . My email id is : dhwankhede(at)gmail(dot)com and my name is Diwakar Wankhede.